Almond butter toffee has been hand-made in old-fashioned copper kettles since 1916. 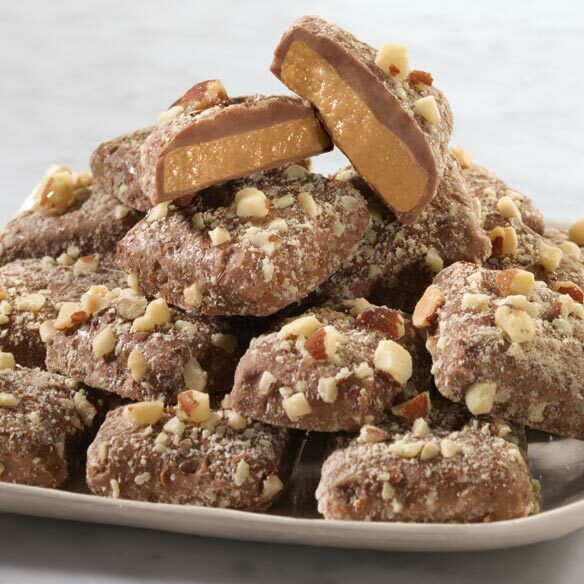 This award-winning toffee boasts a rich history of nutty, buttery bliss! Boasting only the finest ingredients—pure sugar, sweet butter, crisp almonds and smooth, Swiss-style milk chocolate, almond butter toffee candy is the ultimate indulgence ... the ultimate gift! 14 oz. nice amount of sweetness, I love CHOCOLATE! Did a personal review of toffees from a variety of places. These are not the cheapest but they are the favorite. Better then the ones that cost twice as much! These will be the only ones I buy. Good chocolate and crunchy not sticky chewy toffee. I eat till it is gone! The best I have ever eaten. I love,love,love this candy my husband don't eat to much candy but when I order this candy I have to hide some for myself lol. Great taste, but it was crumbly when delivered. Almost as good as the ones purchased at Loft's when I was a child. Perhaps these deserve 5 stars but nothing is as good as what is remembered from childhood. The almond butter toffee candies were good. However, they were not packed well. They were dumped in a box and had almond dust all over them. Not very attractive but nonetheless were good to taste. Had a craving for this but didn't want to go out to store. Butter toffee is my favorite candy.